Jackie is a graduate of Newark's High School of the Performing Arts and Rutgers - The State University of New Jersey. While earning her degree in Psychology at Rutgers University, she continued her formal music education at the Mason Gross School of the Arts. There she trained and further refined her musical style under noteworthy jazz talents as pianist Kenny Barron, drummer Keith Copeland, vibraphonist Steve Nelson and bassist Larry Ridley. As an alumna of Rutgers University, Ms. Jones maintains close ties with the jazz program, frequently returning as a guest performer. Jackie Jones has electrified audiences throughout the United States as well as, Internationally. Ms. Jones musical associations are formidable indeed. She has opened for the legendary Lou Rawls and has performed with numerous noteworthy artists. Her greatest vocal influences are anchored in the tradition of jazz song stylists Billie Holiday, Sarah Vaughan, Nancy Wilson, and Etta Jones. 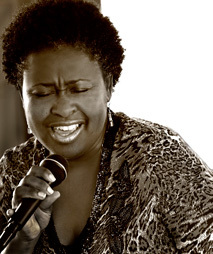 Vocalist, Jackie Jones possesses the poise and talent to carry the torch of jazz legacy to new vistas. This song stylist brings renewed vitality and energy to a grand tradition of musical innovation and virtuosity.